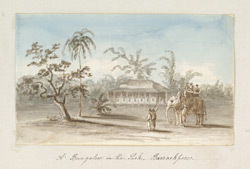 Watercolour of a bungalow at Barakpur near Calcutta in West Bengal, by Marianne Jane James (b. 1805), c. 1828. Inscribed on the mount: ' A Bungalow in the Park, Barrackpore'. Barakpur is located 14 miles from Calcutta and was originally a permanent barracks. When the Marquis Wellesley took over the Commander-in-Chief's residence in 1801, he decided to make improvements to the area. He created a summer residence for future Governor-Generals' and he landscaped the gardens while adding an aviary, a menagerie and a theatre. As a result, Barrackpore Park became a popular place for leisure pursuits. Bungalows were built in the park initially as sleeping quarters for the Governor-General's staff, as Barrackpore House could not contain enough south-facing bedrooms to enable them to catch the cooling southern breeze. Mrs. James writes of a visit made to Lord and Lady Amherst at Barrackpore in February 1828 where they: ''... became initiated in Indian customs, sleeping in bungalows apart from the house, and riding on elephants to see the beauties of the scenery''.